As you may know, Google Reader is going away in July. If you follow this blog through your Google Reader, you will lose not only the link to this blog, but to all blogs you are following. After checking out the two alternative readers (Feedly and Bloglovin’), we recommend that you QUICKLY sign up for Bloglovin’ if you have not already done so. Just click the link provided in the upper section of the sidebar. Bloglovin’ will automatically import all your blogs, and you can continue on your merry way. It is really very similar to Google. Look at the note I found in my campsite this morning! My darling daughter turned up for a visit last night but I was already asleep so rather than disturb me she left me a note in bits and pieces of firewood by my firepit. Sometimes your kids are really cool, you know? In case you can't read it, the note reads "HI MOM XOX"
I had a wonderful time at The Embroiderers` Association of Canada`s National Seminar held in Winnipeg this year. I was so wrapped up in meetings and classes (and guzzling wine in the study room after hours) I managed to only take this one photo of the residence I was in. The facilities were good and the teachers and classes were great. The day after I returned home I managed to injure myself at work and ended up with a bad case of tendinitis and couldn't`t use my hand for two weeks - no stitching, no computer time, etc. I`m happy to say it is fully recovered now and I am back to normal. I wanted to share a few of the little goodies I received the last month. 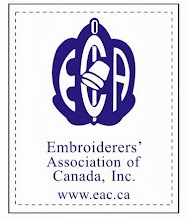 At the Seminar banquet we celebrated EAC`s 40th anniversary and everyone received these lovely little embroidery scissors, complete with a beaded fob and handmade case for them. You cannot see from my photo but the blade of the scissors is engraved EAC 40th Anniversary. I had signed up for Olds Fibre Potpourri but was not able to get away from work to attend but my friends were kind enough to bring me this little gift they gave out at the banquet there. It opens up to hold packages of needles etc and came with a matching set of embroidery scissors. At the EAC Bosrd Meetings the executive is in the habit of exchanging small favours and these next pictures are of a couple of my favourites. Above is a small ceramic thimble - how cute will it look with a small plant in it! 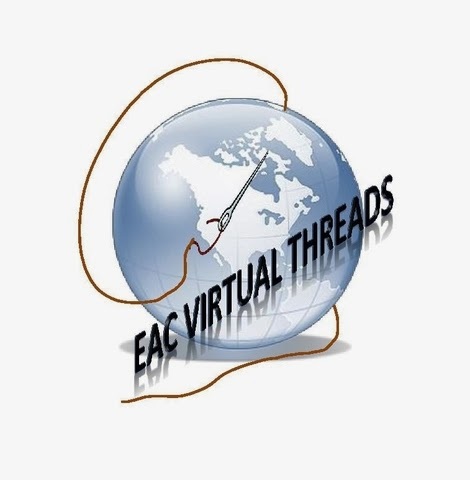 I also love this adorable little hand stitched container with the reminder of EAC`s 40th anniversary on one side and my initials on the other. What could be nicer for keeping your jewelry in when you are travelling!